Thousands of workers experience violence in their workplaces every year. When a traumatic workplace event happens what can you do to help employees recover both emotionally and physically? 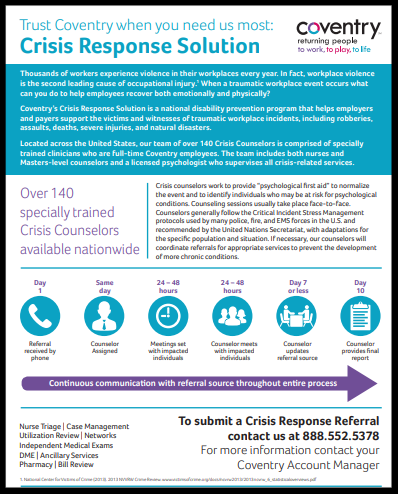 Coventry’s Crisis Response Solution is a national disability prevention program that helps employers and payers support the victims and witnesses of traumatic workplace incidents, including robberies, assaults, deaths, severe injuries, and natural disasters. 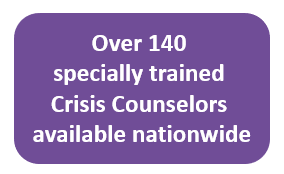 Our crisis counselors work to provide “psychological first aid” to normalize the event and to identify individuals who may be at risk for psychological conditions. Counseling sessions usually take place face-to-face and counselors follow the Critical Incident Stress Management protocols used by many police, fire, and EMS forces in the United States. 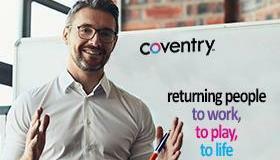 To learn more about Coventry's Crisis Response Solution download our fact sheet.